In fact, many of the leaders in the digital marketing space started as blogs and evolved into multi-million dollar businesses. I personally have immense gratitude for what my company has been able to achieve, and it all traces back to the early Copyblogger audience. Then, around 2008, “business blogging” gave way to the term “content marketing.” Eight years later, as we wind up 2016, we’re drowning in content, and there’s no mistaking that much of it is just poorly-disguised traditional marketing. Something seems to have gotten lost along the way. The original business blogs provided valuable content, sure … but that content was delivered with perhaps the more important ingredient — a relatable, remarkable, and reliable human voice. Darren Rowse: I’m Darren Rowse, and I build online learning communities — and I’m unemployable. Brian Clark: In the beginning, there was blogging. And for businesses looking to build an audience that helped grow the bottom line, it was good. In fact, many of the leaders in the digital marketing space started as blogs and evolved into multimillion dollar businesses. I personally have immense gratitude for what Rainmaker Digital has been able to achieve, and it all traces back to the early Copyblogger audience. 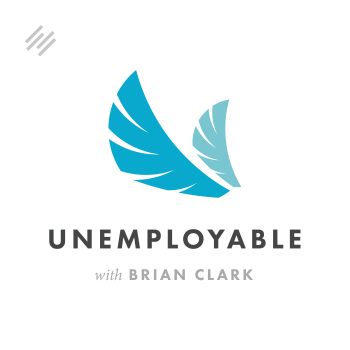 I’m Brian Clark, and this is Unemployable, a podcast for smart, talented people who could get a job, but that’s just not your thing. Thanks for joining us. So then, around 2008, ‘business blogging’ gave way to the term ‘content marketing.’ Eight years later, as we wind up 2016, we’re drowning in content, and there’s no mistaking that much of it is just poorly disguised traditional marketing. To be clear, blogging never went away. But perhaps it’s time to go back to the roots of business blogging to rediscover the foundational aspect of content that actually works as marketing, even though it doesn’t ‘feel’ like marketing. Darren, my friend, it is good to speak with you. It’s been a while. You’ve been busy, I take it. Brian Clark: Yeah, I think so. We’re going to close out this year of Unemployable with no better guest, I think, than Darren Rowse. We can get caught up on all things blogging, or online communities as you put it, which is accurate. But just going back … it’s been forever. For a while there, looking back at 2005, 2006, it didn’t seem like that long ago, and just now to me, it seems like that was a different world. Darren Rowse: Yeah. I just celebrated my 14th year of blogging. It kind of freaked me out a little bit considering my eldest child is only 10 years, and that feels like forever ago. It has been a long time, and so much has happened in the whole space since we started out. It’s matured in so many ways and become a bit of a crazy space in other ways as well. Brian Clark: It is. I almost think in some ways that’s good, but in other ways I think perhaps some people have just lost sight in all of the hoopla — ‘here’s the latest thing,’ and this and that — of what fundamentally we’re trying to do here when it comes to content. Brian Clark: I was reflecting a little bit. It was 2008 when Joe Pulizzi convinced us over at Copyblogger that it was called ‘content marketing.’ I don’t think we ever truly loved that term, still don’t. But it’s become such a huge industry, especially at the enterprise level. Yet if you really look at it — whether it’s audio, video, or text, everything that you put out there as far as reports, SlideShares, what have you — everything we do to attract attention for so-called content marketing, at the base of it, whether you call it this or not, is a blog. It’s what we used to call ‘business blogging,’ and yet that was not an acceptable term, I think, for the enterprise level or a lot of the traditional business community. Is that why we had to go through the machinations of content marketing and this industry that’s been created? Darren Rowse: Yeah. I don’t remember who started calling it business blogging, but when I started using that term, it was always a bit of a cringe-worthy term. I guess in some people’s minds it meant sort of a ma-and-pa business. The larger corporate space didn’t really adopt that term and were looking for something a little more corporatized. Content marketing for me has always been a bit of a personality-less term. It doesn’t actually center around a person. It centers around content, and I think that’s where we get a little bit lost sometimes. But I love what you said about all the content we create today essentially is a blog. What we do on Facebook essentially is blogging. It’s content that appears in chronological order. It’s got a date, and it’s got comments. Essentially that’s what we used to define a blog as when we were arguing about what is a blog. It’s the same form — LinkedIn, Facebook, all of these tools, much the same. Darren Rowse: Yes, totally. I’ve seen so many bloggers give up blogging to get onto all of these different platforms, whether it be Snapchat, YouTube, or whatever it might be. Then they have no place to put their long-form content because so much of it is short, sharp messages or written content. And they regret not having a place to explore their ideas in the written form, which often is the best place for certain sorts of ideas to be communicated. Brian Clark: Oh absolutely. I want to go back a little bit to something you mentioned earlier, which was content marketing became about the content instead of the human being. The early blogging scene really grew out of, you remember, Cluetrain Manifesto, the markets are conversations, human beings, human voices. That was the idea. And that was really the utopian maybe, philosophical bent that was early blogging — and especially early business blogging or entrepreneurial blogging, as ProBlogger helped pioneer. I think you hit it right on the head. When you start talking about content marketing, you lose the fact that it was supposed to be content by a relatable human being. Darren Rowse: Yeah, totally. I look around at the content that I see being shared today, and so much of it is highly optimized. It’s all about the keyword, or it’s all about the curiosity in the title. It’s all about getting people to look at it and getting people to be eyeballed, but it doesn’t actually have any connection. When you get there, there’s no feeling that this person knows who I am and is writing to me. They’re just writing to another machine. I think we’ve somehow gotten obsessed by the metrics and forgotten the fact that there are human beings on both sides of the content. And really, it’s the human being to human being connection that really is what I think blogging was built on. It was the person writing to a person and that second person responding to the person as this sort of relationship that grew. We often talk about social media as being a social thing, and I think it’s lost so much of it. It’s become people just broadcasting and not really pausing to interact with each other. I guess it’s been epitomized by the fact that we’re moving to an age where it’s more and more machine-generated content as well, which just crushes me as I think about the amount of content that’s going to be created by computers and not human beings. It’s sad, but I think it also presents us with a real opportunity at the moment, as people who are willing to go back to our roots and write human to human again. I think that type of content’s going to stand out increasingly in this age of fluffy machine-generated content. Brian Clark: Yeah. You can’t help but pay attention to the prospects of AI, chatbots, machine learning, all this stuff. And yet, if we’ve already lost a bit of the humanity through this emphasis on content, then what’s going to happen then? Even now, it’s all about the funnels, the sequences, the marketing automation, triggers. And yet still, if the message doesn’t connect, if the person the message is from isn’t connecting with the person at the other end of that, you can have all the strategic automation in the world, and it’s not going to convert. Darren Rowse: Yeah. The machines that we build are great, but they’re only really going to serve us if we use them right, use them well, and inject ourselves into them, I guess — particularly in the content space and the online community space. I think I would much rather have used the word ‘community marketing’ back in the day because I think that engages that idea of the person-to-person contact than content marketing. Any way that we can inject that relationship back in using the tools, I think that’s wonderful. In some ways, as much as I’m disillusioned by the space, I’m also excited by some of the opportunities with live video, which I think allows us to inject a little bit more humanity into it. I’ve fallen back in love with podcasting. I think that’s a much more intimate way of communicating. So we are living in a time where we do have choices to do really personality-full content as well. Brian Clark: Yeah, it’s interesting in that regard. A lot of times, you’ll click over to a site, click on ‘blog,’ and most of the content is audio. Hasn’t it always been this way? A trend will rise and then it goes a little too far. I’m not saying that’s happening with podcasting. I’m like you. I love podcasting. We say it’s an honor to be welcomed in to someone’s inbox, but we’re literally speaking inside people’s heads. That’s an honor and a privilege — and an opportunity. But that is also, essentially, when you’re distributing that content from your home base, it’s a mix of various types of content formats on a blog. Darren Rowse: Yeah. To me, that’s how I define a blog today. It’s not written content. I think that used to be our definition of blogging. It was written content. You look at all the early blogs that you would have read and I read, my first blogs were completely text with a tiny thumbnail image in the corner that you could barely even work out what the image was. They’ve become so much more visual. They’ve become the home for all your stuff — whether that be your audio, your infographics, your visual content, or your video. And the great thing about Facebook, Twitter, and Pinterest is that every update you do can be embedded as well. I think there’s an argument for your blog becoming the home of all of that stuff. Brian Clark: Yeah. So it was interesting to me, when we were catching up just before we went on, that, of course, we’ve talked about before, Digital Photography School is an amazing aspect of your business, the more lucrative aspect of your business I think, by a lot. But you, Darren, the starter of it all, spend most of your time now on ProBlogger. Are you passion-driven, or do you really feel that, like me, blogging is far from done and maybe in for a renaissance? Darren Rowse: Yeah. With this new definition of it being the home for all of the stuff that you do, I think it’s a great time for blogging. I suspect in 2017, we’ll see more embracing of the blog as that home base. As all of the different platforms continue to change their algorithms and make content harder to be seen, I think people are going to want that place on their own server, on their own domain, that they can keep all that stuff. So yeah, I’m excited by that. I guess the other reason I’m spending more time on ProBlogger is that it is more of a personality-based blog than Digital Photography School, which was never really a personally branded site. I’ve always allowed our authors there to take the spotlight and sat behind the scenes. It doesn’t need me to continue, whereas ProBlogger is much more of a Darren thing. Brian Clark: Yeah, that’s interesting. As this is the last episode of Unemployable for 2016, I guess I can reveal, it’ll be a surprise to the readers of Copyblogger when I show up again for the first time in years. I’m actually taking back over Copyblogger from an editorial standpoint, but also writing — or committing to write every week. We’ll see. I’m going to start off strong and hopefully by March I’m still going, but I’m in line with you. Copyblogger is not going back to the Brian Clark Show, and ProBlogger isn’t either, right? You guys still have other voices, but Darren being there is important. I think perhaps Brian being back might be helpful as well. I’m almost doing it more for myself, though. Does that make sense? In the sense that I need to feel connected to our audience at a level, as CEO, I might not have really experienced in the last five or six years. Darren Rowse: Yeah, I completely agree with that. I guess the thing we’ve done on ProBlogger this year is really pull back on the random voices that come in and are trying to build a really small of what we’re calling ‘subject matter experts.’ The idea there is that it becomes less about the content, and becomes less about the topic even, and becomes more about the individuals who are going to take our readers on a journey through a topic. So we’ve got someone doing SEO, and he’s written four or five posts already that are built upon each other. They’re becoming I guess mini blogs within the bigger blog of ProBlogger, and our audience are now beginning to recognize these names that are coming up again and again. It’s really slowly bringing a lot of life back to ProBlogger, which always had good content, but never had really, or for the last few years, hadn’t really taken our readers on that journey and created momentum with our content through that relationship. I’ve already signaled that I need to be writing more content as well. Maybe we need to have a challenge, who can keep the weekly content streak going for the longest on our blogs or something. But yeah, I completely agree with that. It’s as much for me as it is my audience. Brian Clark: Yeah, it’s almost like you’ve been eavesdropping on our editorial meetings. We’ve said the same thing. It’s content, yes, but it’s also the person delivering the content. And are they a regular fixture? Is doesn’t have to be that they just love you and can’t live without you. But are you a regular part of the audience’s life in a valuable way, and do they recognize you for that subject matter expertise? I love the way that you’re thinking about that. Both of us started early on allowing guest writers on our blogs, and remember the day when letting someone else talk on your blog was breaking rule number one. I don’t even think people remember that. Guest posting is so pervasive now, but that’s what blogging used to mean. I’m not suggesting that we have to go back to that, but I want to talk about entrepreneurial blogging, really what ProBlogger’s about if you think about it. Everyone’s like, “It’s too late to get started. You guys got started early.” But I remember when I started/ I thought I was too late. It’s always relative. But who breaks through these days? It’s that strong, original voice that brings value. Yes, they use marketing automation, funnels, launches, and all of this other stuff — but the core thing, at the very center of it, is that human being. Darren Rowse: Yep, and extremely valuable content. The people I’m seeing break through, a lot of them are doing really long-form content, and they’re posting once every week or two. They’re not doing daily content. They’re blowing people away with the depth and the comprehensiveness of it, and the practical nature of it as well. They’re not falling for some of the traps that people get sucked into of having to produce a piece of content every day and ending up producing light, fluffy content. They’re standing out with their usefulness, value, and the meaningfulness, I guess, of what they’re doing. Brian Clark: Yeah, that’s a good segue into SEO. We all try to do both, as much and as often, but it had to be excellent quality. Again, long-form content started back with you and I and some of the other early people. Again, one of those rules, 250 words, that’s it. I’m like, where do these rules come from? But of course, whenever there’s a rule, you’re inclined to break it, and that’s going to make you stand out. I am definitely down with higher quality, lower quantity. Do you see that blogging has become disassociated, to some degree, as an SEO strategy? In other words, “We’ve got to crank out a lot of content so we rank well in Google” — even though the algorithm doesn’t even work that way anymore. Darren Rowse: Yeah, it’s interesting. We’ve been ignoring SEO at ProBlogger and DPS for a few years, and I think that’s been good. It has forced us to really focus on our readership and that relationship. Having said that, SEO, search is still the number one source of traffic for us, and in the last year, we’ve realized that it’s something that we probably should have been paying a bit more attention to. We’ve actually swung back a little bit to pay a bit more attention to it, but not in terms of, “Let’s produce as much content as we can.” But, “Let’s just produce the best content we can and really format it in a way that is going to rank a little bit better in Google,” and particularly, getting a little bit sidetracked here, but Google’s featured answers, results, when you do a search now, you’re getting the answer in search results. If you can get that top position where they feature your content, that significantly increases your traffic. I guess we’ve been focusing on formatting our posts to try and get that position in the results. It’s less about quantity of content, but just smart positioning of it. Brian Clark: Yeah, it’s interesting. Again, we’ve been talking about this for years. But even if search engines didn’t exist, even if you didn’t have a shot at ranking ever, keyword research, what people look for, what words do they use when they’re thinking about it, this is a goldmine. Old-school publishers would have killed to have that. So it is an audience-focused thing, as long as you don’t become obsessive. Again, it’s like the same thing with the technology and all those other aspects of automation that are emerging. When you’re just focused on Google, you lose sight of the fact that the people have to like you first in order for Google to like you. Brian Clark: Yeah, it’s topically relevant just because you have certain words in the headline. As good as Google is now at natural language, it gives us actually a little more creative flexibility I think. Darren Rowse: Yeah, for sure. Definitely. It’s getting smarter and smarter, so the better content you’re writing, the better it’s being reacted to and the more it’s being shared, the longer people are spending on it. All of this is actually helping you to rank higher in Google as well, so write engaging, long-form content that’s going to keep people on your site for as long as possible. It all helps. Brian Clark: Yeah. Information is what it is. It’s the what. Blogging is all about the how. How am I connecting? How am I engaging? Am I the type of person that the audience I’m seeking, or the audience attract, I guess, why am I the go-to person? Well, there’s a human connection there. I feel like we’re almost beating a dead human, at this point, but that’s the key. What else are you seeing trend-wise? First of all, you would maintain that blogging never went anywhere, just to make that clear. Darren Rowse: Yeah, for sure. One of the things I’m seeing slowly happening with some bloggers is that they’re — and this taps into that personalization, the relationship aspect that we were talking about — but I think design of blogs is evolving. I’m seeing more and more bloggers really getting smart at trying to get the right content in front of the particular readers at the right time. One of the challenges that blogs have, particularly when you’ve got 8,000 posts like we do in ProBlogger at the moment, is how do I get that right content that people are searching for in front of them to serve their needs right now? One of the things we’ve been trying is creating portals, so every page on ProBlogger has a little thing in the sidebar saying, “I need help with … ” and then we name eight different topics that we know our readers come looking for on ProBlogger. Then, if they click those, they go to a portal, which has a video, me greeting them, and then the best content on that particular topic rather than just the latest content. I think one of the problems with blogs is people come to your blog and they see the latest content on the front page. Unless they just happen to have that need, it’s not going to be relevant to them, so we’re trying to get people to the right content quickly. I’m seeing bloggers also using quizzes a lot for this type of thing. They’re actually trying to work out who their reader is and surface the best content in their archives for their particular needs. I’m hoping that 2017 will see more and more tools being developed to help to do that. We’ve got these assets in our archives that no one ever sees, so how can we surface them for our readers? Brian Clark: Yeah, that’s something we’ve tried over the years with our cornerstone topics. These are the things that we try to rank for, so search traffic comes through these doorways. But from a navigational standpoint, exactly as you said, you direct people there from a topical standpoint, and then that, in our case, generally flows through into our registration for the free content library, which of course gets people on the email list. Now, this is the opportunity for marketing automation to really add value. You know, “You looked at this, so the next logical thing for you to see in our archives that you would never find otherwise is this.” That’s not a substitute for really well-voiced human content in the first place. Darren Rowse: Yeah, and it has to be the human content that they find when they get there. But it’s the machines getting smarter at helping them to find that content that’s just right for them. Whether it’s the topic or whether it’s the author that they’ve been looking at, I think using the machines to take people on a journey in that way and show them that there’s a lot more there for them, I think is really smart. I think there’s opportunities with email as well. We’re seeing more and more of the email tools around being able to tag people and take them through funnels in smarter ways, too. Brian Clark: Yeah, absolutely. Remember the days when bloggers and social media experts said that email was dead every year? Darren Rowse: Yep, for sure. Brian Clark: I don’t think anyone’s falling for that anymore, even now. Darren Rowse: There used to those big massive orange RSS feed buttons. Brian Clark: Oh, those were the days. That’s hilarious. It’s interesting to me, though, that our friends over at ConvertKit, Nathan, all those guys, they chose to position themselves against the big guys as email for professional bloggers. At the beginning, I found that so curious until it took off. And that’s another sign that blogging is growing up. It has grown up, let’s say that, but it’s alive and well, especially as an entrepreneurial kick-starter for a business that you may end up evolving into. Darren Rowse: Yeah. The industry’s still evolving around us. That gives me a lot of hope as well. Not everyone’s calling it blogging anymore, but it still is. There’s so much development going on with WordPress and all of the different platforms as well. Yeah, I’m excited. Brian Clark: Okay. Let’s see. I’m going to put you on the spot for one more trend or prediction that may be something people aren’t realizing is happening in the world of blogging. Darren Rowse: Okay, so I don’t know if it’s a trend yet, but one thing I’m keen to explore in 2017 is the idea of doing seasons of content on blogs. I’ve seen people doing it on podcasts. Brian Clark: Right, I do that. Darren Rowse: Yeah. I think that’s smart, but how does that season approach apply to a blog? Maybe it’s just a different name for a series of content, but part of me is just wondering whether a season could work in a blog as well — whether just a blog that is a standalone blog that’s only ever going to be a one-season blog. I don’t know. It’s just something I’ve seen, obviously, with Netflix, podcasting. How does it apply to the written form as well? Brian Clark: That’s really interesting. When I started Copyblogger, I wrote in series. I wrote 10 articles on Copywriting 101. I don’t remember what the second one was, but that was our cornerstone topics. That’s how that whole idea came into play. I found that incredibly useful, both as the publisher, but I thought it was also valuable for the audience. Then, of course, as you’re saying, it makes an easy way to organize and allow discovery of this great evergreen content for years. You’re not relegating your posts to this random mishmash of archives, which is I would say a downside of what a blog is. That really is how your Facebook page operates. That stuff just disappears until they do one of their algorithmic, “Do you remember you did this on this day?” But in series is interesting. From podcasting, I do it from a practical standpoint because, at least up until this point, I wanted to take the summers off and be able to focus without worrying about, “Oh, I’ve got to get a guest or an episode,” or what have you. But yes, we do live in a Netflix world. Give me a scenario how this would work. You have January to May is the spring season of blog X, and then what? Do you stop for a little bit or do you … ? Darren Rowse: Yeah. I don’t see why not. I don’t know why a blog has to produce content every day. We’ve already said that it doesn’t. It doesn’t have to produce it every week. But what if it produced it three posts a week for three months? Then, it took a month off, and then all of those posts related to each other that were designed to take people from point A to point B. In some ways, it’s kind of similar to what I used to do with 31 Days to Build A Better Blog. It was, “This month, this is what we’re doing, and we’re going to do it together.” I guess you could make it more of a theme on an aspect of your topic, and it becomes a bit more of an event that people share. I don’t know. I’m brainstorming literally as I’m talking to you. Brian Clark: No, I love this. This is good stuff. This is what needs to happen. Going back to what you said about the way people are starting to be smart in playing with traditional concepts of website navigation, when you really think about it, navigation hasn’t changed since the ’90s. It’s the same concept. And I do think that things like chatbots and AI are going to radically change the way we interface with information, and I wonder what that will mean in the context of what we think of as blogging. Darren Rowse: Yeah. I don’t think it has to be written content as well. You could bring your podcast into the season. You could do video into the season. I guess in some ways you’re almost creating a course, too, and maybe it is a course that we’re talking about but on the blog. Yeah, it doesn’t have to be any of these things, really. It could be anything. Brian Clark: Yeah. We shouldn’t be constrained by tradition. Darren Rowse: Yeah, and I think this takes the anxiety out of having to have that indefinite deadline. Brian Clark: Yeah. It’s a perpetual slog. Remember when I took guest writers for the first time? It’s because I wanted to take a vacation and I was freaked out about leaving the blog fallow for a week. Brian Clark: I remember covering for you when you had a kid. Didn’t you have a kid, or was that a vacation? I don’t remember. Darren Rowse: I told you it was a kid, but it was really a vacation. Brian Clark: That’s hilarious. Okay, so you’re going to be in the states for Social Media Marketing World, correct? Darren Rowse: Yes, in March, San Diego. Brian Clark: Are you going to hit other conferences while you’re here? Darren Rowse: I’m talking to one other conference at the moment for towards the end of the year, but I don’t think I’m at liberty to speak about that yet. But I’ll just be over there twice this next year. Brian Clark: Cool, well, I will definitely see you in San Diego. You’ll probably have figured all this out. Darren Rowse: Yes, for sure. I’ll probably talk about it. Brian Clark: This season thing, you’ll have it all worked out by then. I’m looking forward to seeing you, man. It’s been good to catch up. Tell us where to find you and anything going on that people should know about in the next near term for ProBlogger. Darren Rowse: Yeah, so we have finally moved over to ProBlogger.com, which is unbelievable. Brian Clark: It only took 12 years. Darren Rowse: Twelve years. The blog actually still isn’t on .com, but if you go to ProBlogger.com, you’ll find the podcast. You’ll find the blog, and you’ll find our event, all our ebooks, and pretty much everything else. Then Digital Photography School is where else you’ll find me. Brian Clark: Yeah, talk a little bit about the ProBlogger event. I should have brought that up earlier, but those have become an incredible success in Australia. Are we outside of Australia yet? Darren Rowse: Again, we’re talking at the moment about doing something in the states this year. Brian Clark: Okay, that was what you were hinting at. Darren Rowse: It’s toward the end of the year, in conjunction potentially with another conference. We’ll see where that leads, but we’ve done seven events in Australia. Last year, we had 750 bloggers come out. I didn’t even know there was that many in Australia. Darren Rowse: Yeah, it’s been a great thing for the Aussie blogosphere, and I think it’s probably the best thing that we do. It’s something that we get so much positive feedback on, and it really helps us to create that more personal content going forward as well. We’ve just had this intense period of meeting our readers and hearing their needs, so a live event’s a great way to build that relationship and take that virtual thing into a real space as well. Brian Clark: Darren, thanks so much for being here. Darren Rowse: Yeah, no problem. It’s great to chat again. Brian Clark: All right, everyone. I don’t care if you call yourself a blogger or you call it a blog, but maybe it’s time to start thinking like a blogger and making that intimate, engaging connection with an audience. That really is the thing that drives it. Then we’ll add on all the automation, the cool lights and buzzers, and all that. This is going to be a topic we’re going to talk about in the next season, next year, of Unemployable. We’ll be back the second week of January, so just taking a short break this time. In the meantime, thank you for listening, and keep going.